The first of Aleta’s stylised floral paintings were applied to silk and linen fabrics in 2003, forming the foundation of her textile collection ‘Aurora’. Prior to establishing her own company Aleta Ltd, she managed London based textile company Titri, distributing and promoting the best of Indian textiles worldwide, including the renowned block printed florals of Brigitte Singh. Aleta is now best known for specialising in fabrics inspired by the decorative arts of 17th Century Mughal India, from the finest reproductions of ancient textiles to contemporary reinterpetations of classic motifs. 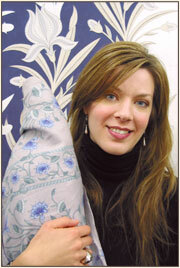 Although Aleta embraces and works with the newest advances in print technology, she believes something genuine and intrinsically beautiful is lost when the computer is used too early in the design process, and so each of her intricate floral designs is drawn and painted by hand before going to print. Keeping traditional skills alive is also important to her –technology cannot recreate the beautiful imperfection of a hand blocked print, or the tactile variance of a hand embroidered stitch. However, she also strives to take advantage of what digital technology has to offer, and is proud to support British manufacture by producing the entire Aleta collection in England. Aleta uses only fabrics which are created using 100% natural fibres. She prefers the warmth and genuine quality of natural cottons and linens, and has recently introduced a finely woven upholstery weight hemp to her range of fabrics. The first of her wallpapers became available in 2006, and in the spring of 2007 the first 8 colours of her co-ordinating paint collection ‘Mughal Spring’ was launched, in collaboration with Francesca’s Paints. 16 additional paint colours have since been added to the range, with a further 8 being added in the autumn of 2008. Aleta is currently working on her next collection, inspired by the carved stone jali screens of Indian and Islamic architecture. Aleta holds a degree in Fine Art from the Nova Scotia University of Art and Design, specialising in surface design and art history.